Great thing about Assam is temperature sometime increases 35 to 38 degree, but just like today, the rains are so frequent here and which keeps reducing the temp. In each monsoon,( starts in the end of june ) the wind from the sea Bay of bengal and Arabian, comes to noth-east and wind that carries water vapour get struck in the great mountain Himalaya, and the water vapous returns above north -east and it condenses there, and here in Assam, meghalaya heavy rains falls. Well, world's heaviest rain falling place is Cherapunji and this place just adjacent to Assam. well , when temp rises to 35 degree Celsius , from the sea Bay of bengal, water vapour production also increases, and the sea wind takes the water to Assam and Meghalaya, and when the vapour condenses, after getting hit in cold mountain Himalaya, it becomes cloud and rain falls here. You see, India is a sub-tropical country,that is why. I love rain, because, it cools down the environment,and when it rains after a long hot day with temp 35, its like blessing. A rainfall is what every one wants in a day like that, well yesterday was kind of that day. When monsoon comes, there is so many things come. It is the season ripened mango, Jack-fruit and so many other fruits. 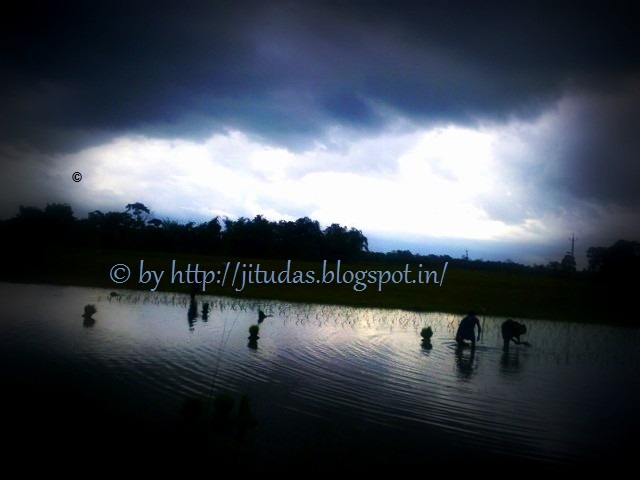 It is time, when paddy seedlings are planted by womens in the paddy fields. So much activity, so much life. It is the busiest season in Assam. Every farmers gets busy working in field corps. Most farmers use cows and bull to plough the soil in the paddy fields. Well, tractors are in the trend nowadays. The farmers, wake up 5 am, they go to their fields to plough, and he would plough till afternoon, no matter whether it is a hot day or it rains. So, as you can life is not very luxurious in a sense. But, the people have no big dreams and passions, they work hard to make their children educated,so they can get jobs. But, it may seem bit down, but there is something, that makes the people amazing. What is it ? It is the relationship with members of the family, relatives and neighbors . But, as the cities and towns are increasing, people are loosing that strong bond and warmth relationship. Somehow, cities takes more than it gives you.